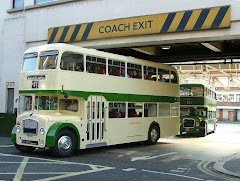 BusWorks Blog: Crosville FSF complete - well almost! Lodekka DFG81 out on test and for official photographs posed near the entrance to Blackpool Zoo. It was 1983 when DFG81 last operated in Rhyl on service M87. Crosville FSF6G DFG81, one of two survivors out of a trio of FSFs converted to open top for use in Llandudno & Rhyl, is now essentially complete - apart from a few minor items and the fitting of the perspex windshields. The bus will soon be returning to the new Crosville Motor Services based further down the British coastline from DFG81's former territory in North Wales - Weston Super Mare. At the request of our client, the Lodekka has adopted the Bristol Omnibus open top cream & black livery, a throwback to the days when Weston Super Mare was a bustling seaside resort with convertible open toppers in charge of the sea front bus service. Click here for a picture of restored Lodekka from Weston Super Mare.